Archaeologists are hoping to unearth secrets from Scotland’s whisky-making past in a dig this week at a remote Highland farm distillery that dates back nearly 200 years. Blackmiddens, sometimes referred to as Black Middens, located in the remote Upper Cabrach on the border between Moray and Aberdeenshire, began production in 1825, two years after the 1823 Excise Act helped encourage the small-scale distillation of whisky. The act helped lure previously illegal distillers down from the hills, leading to the establishment of small farm distilleries such as Blackmiddens, which only made whisky between 1825 and 1833, possibly because of the lack of fresh water in the locality and its susceptibility to crop failure. The distillery, operated by tenant farmer James Smith and then by his wife Elizabeth, would have had a small still with a capacity of only 40 gallons (180 litres), compared to a typical modern pot still, which might hold thousands of litres. Historically located on the Duke of Richmond’s estate, the farm was occupied by William Smith in 1864, according to the Evaluation Rolls, and was later associated with the Sharp family. Blackmiddens distillery was renamed Buck in 1827, according to research commissioned by the Cabrach Trust, which rejects the idea that there were two legal distilleries in the area – one at Blackmiddens Farm and one at Buck Farm. 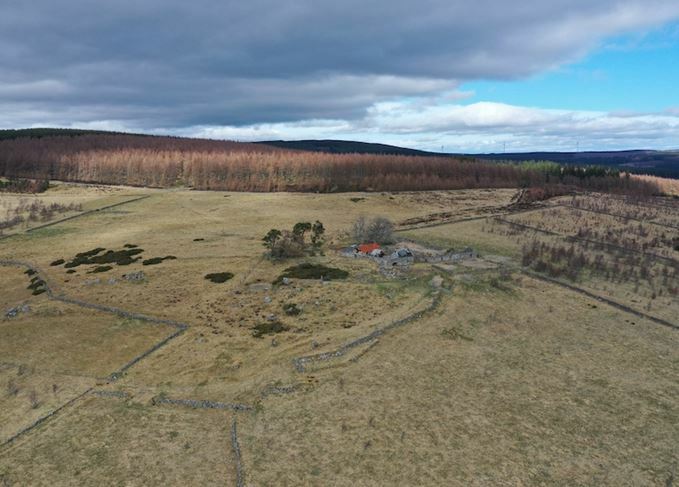 Excavation work at Blackmiddens began on Monday (8 April), led by the Cabrach Trust with aid from Forestry and Land Scotland, and Historic Environment Scotland, and is due to conclude tomorrow (Thursday). The Cabrach area was notorious for illegal whisky distillation and smuggling, as recalled by 66-year-old Joan Harvey, whose great-great-uncle, James Sharp, was tenant farmer at Blackmiddens, and a leader of the smugglers. ‘I was always told that my great-great-uncle was the head of the gang at the time,’ she said. ‘We were the “freebooters” who took the whisky to Aberdeen to sell in the pubs. The ‘freebooters’ used imaginative tactics to outwit the excisemen, she added. ‘I was also told that, one time, the excisemen were trying to catch the smugglers and had set up barricades all around Aberdeen. ‘The Cabrach is a place of many secrets,’ said Ann Brennand, chief executive of the Cabrach Trust, which plans to start a distillery and visitor attraction of its own at Inverharroch Farm. Blackmiddens today is part of Scotland’s national forest estate, managed by Forestry and Land Scotland (known, until recently, as Forestry Commission Scotland). The organisation’s national environment advisor Matt Ritchie said: ‘Illicit whisky stills can be found throughout the Highlands, but they were particularly common in the Cabrach. They are difficult to spot, but once you know what you are looking for, you can find them tucked away next to burns in the hills. The money will finance a distillery and heritage centre highlighting the area’s illicit whisky past.